In the painting I have shown here, I really like the way Kira has used the dark trees and mountains as well as the foreground shadows to frame the center of interest. The value contrast makes the yellow grasses, blue water, and the tall trunks of the poplars really stand out. I also like the textures, and the sense of movement created by the curvy branches. For the last six weeks, we have had a long cold spell with only a few breaks. The temperature has varied between about -18 and -35 degrees Celsius. However this weekend, it also has been windy, with a wind chill factor of -40. Minus 40 is the same in both the Celsius and Farenheit scales. At minus 40, exposed skin freezes in 10 minutes. However, it is the weekend, and I was getting stir crazy from being cooped up indoors. So Kate (our dog) and I went out walking. Yesterday was a gloriously sunny day with a brisk wind, wind chill of minus 40, and we managed a 40 minute walk. Today, it has snowed steadily. We went out at the warmest part of the afternoon, -19 on the thermometer with a moderate wind. We stayed in the residential area rather than venturing out on the exposed hills, and this time I bundled up better with long underwear, fleece, a down jacket, warm toque and gloves, and a scarf. When the wind was sharp, I pulled the scarf up over my nose and mouth. Kate was eager for each walk, but also happy to arrive back home to warm up. 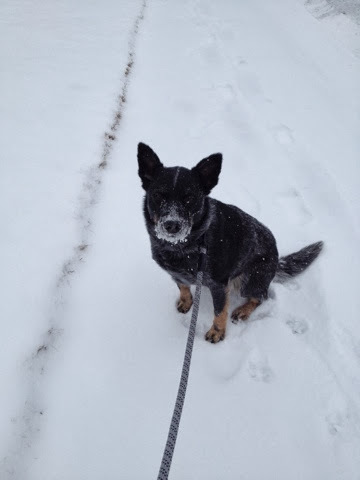 The photo below, snapped near the end of our half-hour walk today, shows her with icicles on her chin. Her feet were getting cold as well and she started to hobble on 3 feet. But what the heck - we are hardy Northeners, and her feet were fine once she warmed up. Or, maybe we're not so hardy. Now that I am in late middle age, I find I have much less tolerance for the cold. My lips are chapped. Every joint and muscle aches. The skin on my fingers cracks and bleeds. I have exema on the insides of my elbows. Whine, whine. I don't like to admit to this softness. Growing up in northern Canada, cold winters were the norm. Winters were longer and colder back then, and we went outside to play except in the very coldest weather. We walked to school and back, a distance of about a kilometre each way, and to town with my mom to buy groceries. When I was a child, we did not have the wonderful fabrics that we have today: fleece and down and technical base layers. We wore ankle height lined rubber overshoes over our leather school shoes, or hand-knit woollen socks in lined gumboots. We had knitted toques and mittens that never failed to become soaking wet while we played in the snow building forts, making snow angels, and dragging the younger children on the toboggan on imaginary pioneer trips into the bush. We tolerated the cold and went on with our lives. That was just the way it was. Balaclavas, familiar now as gangster attire, became popular as I reached my teen years. They covered the face, protecting the cheeks and nose from freezing. I have frozen my cheeks and nose and ears, and understand to value of covering exposed flesh. However, as a teenaged girl, I refused to wear a balaclava except in the most extreme circumstances, and only if none of my peers would see me. I remember my breath freezing on the wool near my nose and mouth and the feeling of wet wool and ice against my face, chapping the skin. Nowadays, we have grown soft. We run from our warm, centrally heated homes to our pre-warmed cars, and from the cars to warm malls or office buildings. People just don't go outside except in perfect weather, unless they are skiers or snowmobilers. Yesterday, in 40 minutes, I only saw one other person outside - a bundled up man also walking his dog. He greeted me effusively. Mostly I saw people whizzing by in cars, craning their necks to look at me (that fool walking a dog!). Today, I saw two men outside shovelling their walks. I certainly did not see any children playing out of doors. Cold weather. I do not like it anymore. However, I am old enough to remember cold winters as way of life.